How I Feel About Books: Banned Book: Are You There God? It's Me, Margaret. Banned Book: Are You There God? It's Me, Margaret. Another book I read and loved as a kid. I was convinced I was going to be as cool as I thought Margaret was by sixth grade. (I had a different cover version with what I thought was a gorgeous Margaret.) 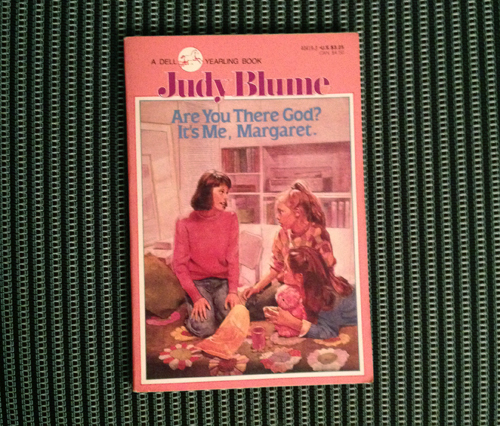 I don’t think it happened, but I always love a Judy Blume children’s book. I loved reading about stuff that was going to be happening to me in a way that was relatable and easy to understand, instead of a heavy nonfiction book of facts. Re-reading it as an adult was still really enjoyable, maybe mostly due to nostalgia, but I think kids these days (wow am I old!) would still relate to the book. The storyline of Margaret’s first period is pretty dated, with her having to learn to attach pads to a belt with a series of hooks… I’m sure there are new novels dealing with this that would be more helpful for preteens. The storyline is entertaining and quaint. This book was banned because some people thought it was sexually offensive, immoral, profane, and offensive. I don’t think it should be restricted from readers because they need to know this information (well, updated information in the case of periods, but still), and it’s easy to read since it’s in a fiction story.